Many individuals today struggle with the effects of chronic stress, whether due to social and environmental factors or as a result of trauma embedded in their psychophysiology. Research has demonstrated that once an individual endures a traumatic event, there are undesirable changes that occur in the brain and body It is of the utmost importance that mental health counselors consider the relationship between the body and mind. 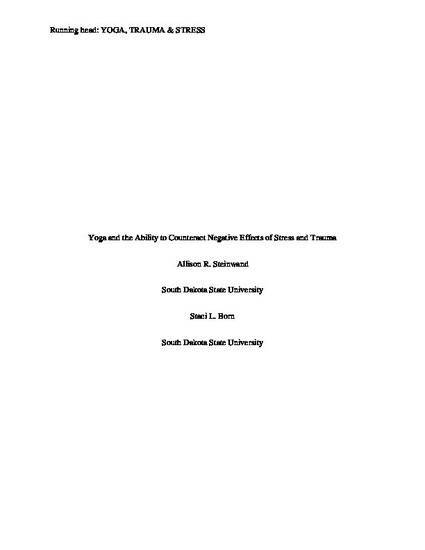 The purpose of this paper is to describe the negative impact traumatic experiences and chronic stress has on the brain and body. Furthermore, the ways in which yoga practice can mitigate trauma symptoms and stress will be explored. Incorporating yoga as an adjunct to talk therapy has been found to lower stress levels while also working to repair biological mechanisms holding these ongoing stress patterns in place. Implications for mental health counselors will be discussed.